Enteroviruses usually cause transient, often subclinical, infections. They are responsible for a wide variety of syndromes, including exanthematous fever, enteritis, encephalitis, aseptic meningitis, myocarditis, and respiratory tract infections. Coxsackieviruses, echoviruses, and enterovirus type 71 are also significant causes of cutaneous disease. Enteroviruses cause outbreaks that range from small, community clusters due to acute hemorrhagic conjunctivitis, to large nationwide human enterovirus 71 epidemics. A relationship between enterovirus' RNA and chronic fatigue syndrome has been described. These viruses could initiate and perpetuate the immunological response seen in chronic fatigue syndrome. Echoviruses include 34 distinct serotypes, and at least half can cause a rash. The two skin diseases specifically associated with echoviruses are Boston exanthem disease (BED), caused by echovirus type 16, and eruptive pseudoangiomatosis, (EP) caused by echovirus types 25 and 32. These infectious agents are highly contagious, and are a common cause of widespread outbreaks. After the ingestion of infectious particles, enteroviruses are implanted and replicated in the alimentary tract (nasopharynx and ileum). If local replication is limited, the disease remains asymptomatic. If the virus passes into the regional lymphatic nodes and the reticuloendothelial system organs, minor or nonspecific disease may develop. Viruses may also disseminate by hematogenous spread, which results in a more severe and characteristically systemic disease. Immune activation by the enterovirus leads to the production of immunoglobulin M (IgM) type-specific antibodies, which may be detected in the serum 1 week after infection. They are responsible for neutralization and rapid elimination of the virus from the blood and other sites of implantation. Serum IgM antibodies can be detected for 6 months after the patient's recovery, and convalescent immunoglobulin G can be detected for 1-2 years. Most enteroviral infections confer lifelong immunity to the serotype-specific agent. In addition, antibodies to these related viruses are known to cross-react, and they do so in different patterns, based on country, serotype, and specific population, making comparisons of disease-based studies among these groups difficult. Coxsackieviruses and echoviruses cause many nonspecific exanthems and enanthems. An exanthem (ie, nonspecific morbilliform eruption) normally occurs 3-4 days before the characteristic enanthem (ie, oral vesicles) appears. Note the images below. Erosions on the base of the tongue. A red halo surrounds several vesicles on the finger flexures and palms. Small linear vesicle on the thumb. 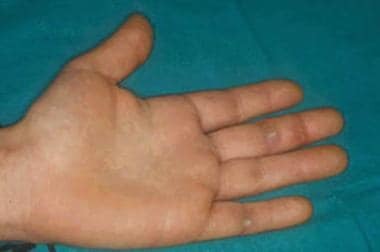 Vesicle on the dorsal hand of a young adult. Seasonal distribution is a characteristic feature. In temperate climates, enteroviral infections are more common in the summer and autumn, whereas in tropical areas, they tend to occur year round. The most characteristic clinical syndromes caused by enteroviruses are described below. The main cause is coxsackie A virus (CVA) (serotypes 2-6, 8, and 10). Other viral etiologies include coxsackie B viruses (CVB) (serotypes 1-4), echoviruses, adenoviruses, and other enteroviruses. [14, 15] After an incubation period of approximately 4 days, the disease begins with acute onset of fever (temperature range, 38.5-40°C) accompanied by headache, sore throat, dysphagia, anorexia, and, occasionally, vomiting and abdominal pain. See Herpangina for more detailed information. See Hand-Foot-Mouth Disease for more information. BED is caused by echovirus 16. As with HFMD, BED begins with a brief febrile prodrome. Acute hemorrhagic conjunctivitis [23, 24, 25] is linked to enterovirus 70 and CVA 24. Widespread vesicular eruption is linked to CVA 4. Gianotti-Crosti–like eruption is linked to CVA 16. Rubelliform eruption is linked to echovirus 2. Morbilliform eruption is linked to echoviruses 6, 11, and 25. Rubelliform or morbilliform eruption is linked to echovirus 9. Petechiae are linked to echoviruses 11 and 19. Punctate macular eruption is linked to echovirus 19. Vesicular eruption is linked to echovirus 11. The overall number has been estimated at 1 billion or more annually worldwide. 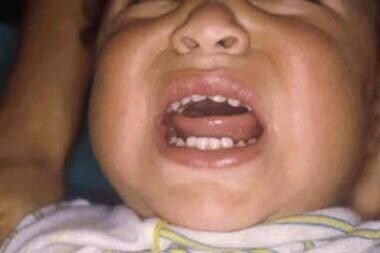 A few cases of prolonged or recurrent hand-foot-mouth disease (HFMD) have been reported. In 1964, Evans and Waddington  reviewed a large outbreak in South Wales and already described a relapsing course occurring over 2 years in one patient. Some evidence suggests that enterovirus 71 CNS involvement can cause not only acute and severe complications with higher mortality, but also long-term neurologic and psychiatric disorders. Occasionally, cardiac complications occur, leading to fulminant myocarditis and death in neonates. Deaths in neonates infected with enteroviruses have been reported and are usually the result of fulminant myocarditis. Propper hand washing is recommended in people in contact with an enteroviral infection in order to decrease disease transmission. Krasota A, Loginovskih N, Ivanova O, Lipskaya G. Direct Identification of Enteroviruses in Cerebrospinal Fluid of Patients with Suspected Meningitis by Nested PCR Amplification. Viruses. 2016 Jan. 8(1):E10. [Medline]. Pons-Salort M, Parker EPK, Grassly NC. The epidemiology of non-polio enteroviruses: recent advances and outstanding questions. Curr Opin Infect Dis. 2015 Oct. 28(5):479-87. [Medline]. Solomon T, Lewthwaite P, Perera D, Cardosa MJ, McMinn P, Ooi MH. Virology, epidemiology, pathogenesis, and control of enterovirus 71. Lancet Infect Dis. 2010 Nov. 10(11):778-90. [Medline]. Chia JK. The role of enterovirus in chronic fatigue syndrome. J Clin Pathol. 2005 Nov. 58(11):1126-32. [Medline]. [Full Text]. Bowles NE, Dubowitz V, Sewry CA, Archard LC. 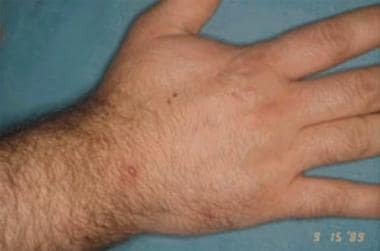 Dermatomyositis, polymyositis, and Coxsackie-B-virus infection. Lancet. 1987 May 2. 1(8540):1004-7. [Medline]. Robinson CR, Doane FW, Rhodes AJ. Report of an outbreak of febrile illness with pharyngeal lesions and exanthem: Toronto, summer 1957; isolation of group A Coxsackie virus. Can Med Assoc J. 1958 Oct 15. 79(8):615-21. [Medline]. [Full Text]. Alsop J, Flewett TH, Foster JR. "Hand-foot-and-mouth disease" in Birmingham in 1959. Br Med J. 1960 Dec 10. 2(5214):1708-11. [Medline]. [Full Text]. Pappas DE, Hendley JO, Schwartz RH. Respiratory viral RNA on toys in pediatric office waiting rooms. Pediatr Infect Dis J. 2010 Feb. 29(2):102-4. [Medline]. Civardi E, Tzialla C, Baldanti F, Strocchio L, Manzoni P, Stronati M. Viral outbreaks in neonatal intensive care units: what we do not know. Am J Infect Control. 2013 Oct. 41(10):854-6. [Medline]. Midgley CM, Watson JT, Nix WA, Curns AT, Rogers SL, Brown BA, et al. Severe respiratory illness associated with a nationwide outbreak of enterovirus D68 in the USA (2014): a descriptive epidemiological investigation. Lancet Respir Med. 2015 Nov. 3 (11):879-87. [Medline]. Holm-Hansen CC, Midgley SE, Fischer TK. Global emergence of enterovirus D68: a systematic review. Lancet Infect Dis. 2016 May. 16 (5):e64-e75. [Medline]. Couch RB, Douglas RG Jr, Lindgren KM, Gerone PJ, Knight V. Airborne transmission of respiratory infection with coxsackievirus A type 21. Am J Epidemiol. 1970 Jan. 91(1):78-86. [Medline]. Peláez D, Guzmán BL, Rodríguez J, Acero F, Nava G. Presence of enteric viruses in water samples for consumption in Colombia: Challenges for supply systems. Biomedica. 2016 Apr 15. 36:169-78. [Medline]. Park K, Lee B, Baek K, Cheon D, Yeo S, Park J, et al. Enteroviruses isolated from herpangina and hand-foot-and-mouth disease in Korean children. Virol J. 2012 Sep 17. 9(1):205. [Medline]. Mirand A, Henquell C, Archimbaud C, Ughetto S, Antona D, Bailly JL, et al. Outbreak of hand, foot and mouth disease/herpangina associated with coxsackievirus A6 and A10 infections in 2010, France: a large citywide, prospective observational study. Clin Microbiol Infect. 2012 May. 18(5):E110-8. [Medline]. Yang Q, Zhang Y, Yan D, Zhu S, Wang D, Ji T, et al. Two Genotypes of Coxsackievirus A2 Associated with Hand, Foot, and Mouth Disease Circulating in China since 2008. PLoS One. 2016. 11 (12):e0169021. [Medline]. Puenpa J, Vongpunsawad S, Österback R, Waris M, Eriksson E, Albert J, et al. Molecular epidemiology and the evolution of human coxsackievirus A6. J Gen Virol. 2016 Dec. 97 (12):3225-3231. [Medline]. Davia JL, Bel PH, Ninet VZ, Bracho MA, González-Candelas F, Salazar A, et al. Onychomadesis outbreak in Valencia, Spain associated with hand, foot, and mouth disease caused by enteroviruses. Pediatr Dermatol. 2011 Jan-Feb. 28(1):1-5. [Medline]. Lee TC, Guo HR, Su HJ, Yang YC, Chang HL, Chen KT. Diseases caused by enterovirus 71 infection. Pediatr Infect Dis J. 2009 Oct. 28(10):904-10. [Medline]. Huang J, Liao Q, Ooi MH, Cowling BJ, Chang Z, Wu P, et al. Epidemiology of Recurrent Hand, Foot and Mouth Disease, China, 2008-2015. Emerg Infect Dis. 2018 Mar. 24 (3):[Medline]. Prose NS, Tope W, Miller SE, Kamino H. Eruptive pseudoangiomatosis: a unique childhood exanthem?. J Am Acad Dermatol. 1993 Nov. 29(5 Pt 2):857-9. [Medline]. Miller PK, Zain-Ul-Abideen M, Paul J, Perry AE, Linos K, Carter JB, et al. A case of eczema coxsackium with erythema multiforme-like histopathology in a 14-year-old boy with chronic graft-versus-host disease. JAAD Case Rep. 2017 Jan. 3 (1):49-52. [Medline]. [Full Text]. Oberste MS, Michele SM, Maher K, et al. Molecular identification and characterization of two proposed new enterovirus serotypes, EV74 and EV75. J Gen Virol. 2004 Nov. 85:3205-12. [Medline]. Mirkovic RR, Kono R, Yin-Murphy M, Sohier R, Schmidt NJ, Melnick JL. Enterovirus type 70: the etiologic agent of pandemic acute haemorrhagic conjunctivitis. Bull World Health Organ. 1973. 49(4):341-6. [Medline]. [Full Text]. Mirkovic RR, Schmidt NJ, Yin-Murphy M, Melnick JL. Enterovirus etiology of the 1970 Singapore epidemic of acute conjunctivitis. Intervirology. 1974. 4(2):119-27. [Medline]. Yaffee HS. Erythema multiforme caused by Coxsackie B5. A possible association with epidemic pustular stomatitis of children. Arch Dermatol. 1960 Nov. 82:737-9. [Medline]. Jaidane H, Sane F, Gharbi J, Aouni M, Romond MB, Hober D. Coxsackievirus B4 and type 1 diabetes pathogenesis: contribution of animal models. Diabetes Metab Res Rev. 2009 Oct. 25(7):591-603. [Medline]. Richer MJ, Horwitz MS. Coxsackievirus infection as an environmental factor in the etiology of type 1 diabetes. Autoimmun Rev. 2009 Jun. 8(7):611-5. [Medline]. Enterovirus surveillance--United States, 1997-1999. MMWR Morb Mortal Wkly Rep. 2000 Oct 13. 49(40):913-6. [Medline]. Centers for Disease Control and Prevention. Enterovirus D68. Available at http://www.cdc.gov/non-polio-enterovirus/about/ev-d68.html. June 10, 2016; Accessed: July 5, 2016. Duong V, Mey C, Eloit M, Zhu H, Danet L, Huang Z, et al. Molecular epidemiology of human enterovirus 71 at the origin of an epidemic of fatal hand, foot and mouth disease cases in Cambodia. Emerg Microbes Infect. 2016 Sep 21. 5 (9):e104. [Medline]. World Health Organization. Hand, Foot, and Mouth Disease Situation Update Number 490. Available at http://www.wpro.who.int/emerging_diseases/HFMD/en/. June 14, 2016; Accessed: June 28, 2016. Zhou ZM, Xu Y, Hu CS, Pan QJ, Wei JJ. Epidemiological Features of Hand, Foot and Mouth Disease during the Period of 2008-14 in Wenzhou, China. J Trop Pediatr. 2017 Jun 1. 63 (3):182-188. [Medline]. Kim HJ, Hyeon JY, Hwang S, Lee YP, Lee SW, Yoo JS, et al. Epidemiology and virologic investigation of human enterovirus 71 infection in the Republic of Korea from 2007 to 2012: a nationwide cross-sectional study. BMC Infect Dis. 2016 Aug 18. 16 (1):425. [Medline]. Koh WM, Bogich T, Siegel K, Jin J, Chong EY, Tan CY, et al. The Epidemiology of Hand, Foot and Mouth Disease in Asia: A Systematic Review and Analysis. Pediatr Infect Dis J. 2016 Oct. 35 (10):e285-300. [Medline]. Neri I, Dondi A, Wollenberg A, Ricci L, Ricci G, Piccirilli G, et al. Atypical Forms of Hand, Foot, and Mouth Disease: A Prospective Study of 47 Italian Children. Pediatr Dermatol. 2016 Jul. 33 (4):429-37. [Medline]. Evans AD, Waddington E. Hand, foot and mouth disease in south Wales, 1964. Br J Dermatol. 1967 Jun. 79(6):309-17. [Medline]. Lønnberg AS, Elberling J, Fischer TK, Skov L. Two cases of hand, foot, and mouth disease involving the scalp. Acta Derm Venereol. 2013 Jul 6. 93 (4):467-8. [Medline]. Balestri R, Bellino M, Landini L, Tasin L, Rizzoli L, Speziali L, et al. Atypical presentation of enterovirus infection in adults: outbreak of 'hand, foot, mouth and scalp disease' in Northern Italy. J Eur Acad Dermatol Venereol. 2018 Feb. 32 (2):e60-e61. [Medline]. Laga AC, Shroba SM, Hanna J. Atypical hand, foot and mouth disease in adults associated with coxsackievirus A6: a clinico-pathologic study. J Cutan Pathol. 2016 Nov. 43 (11):940-945. [Medline]. [Full Text]. Second J, Velter C, Calès S, Truchetet F, Lipsker D, Cribier B. Clinicopathologic analysis of atypical hand, foot, and mouth disease in adult patients. J Am Acad Dermatol. 2017 Apr. 76 (4):722-729. [Medline]. Huang WC, Huang LM, Lu CY, Cheng AL, Chang LY. Atypical hand-foot-mouth disease in children: a hospital-based prospective cohort study. Virol J. 2013 Jun 24. 10:209. [Medline]. [Full Text]. Drago F, Ciccarese G, Broccolo F, Rebora A, Parodi A. Atypical hand, foot, and mouth disease in adults. J Am Acad Dermatol. 2017 Aug. 77 (2):e51-e56. [Medline]. Lee BE, Davies HD. Aseptic meningitis. Curr Opin Infect Dis. 2007 Jun. 20(3):272-7. [Medline]. Nathan M, Walsh R, Hardin JT, et al. Enteroviral sepsis and ischemic cardiomyopathy in a neonate: case report and review of literature. ASAIO J. 2008 Sep-Oct. 54(5):554-5. [Medline]. Zhang YF, Deng HL, Fu J, Zhang Y, Wei JQ. Pancreatitis in hand-foot-and-mouth disease caused by enterovirus 71. World J Gastroenterol. 2016 Feb 14. 22 (6):2149-52. [Medline]. Greninger AL, Naccache SN, Messacar K, Clayton A, Yu G, Somasekar S, et al. A novel outbreak enterovirus D68 strain associated with acute flaccid myelitis cases in the USA (2012-14): a retrospective cohort study. Lancet Infect Dis. 2015 Jun. 15(6):671-82. [Medline]. Ohara N, Kaneko M, Nishibori T, Sato K, Furukawa T, Koike T, et al. Fulminant Type 1 Diabetes Mellitus Associated with Coxsackie Virus Type A2 Infection: A Case Report and Literature Review. Intern Med. 2016. 55 (6):643-6. [Medline]. Long L, Gao LD, Hu SX, Luo KW, Chen ZH, Ronsmans C, et al. Risk factors for death in children with severe hand, foot, and mouth disease in Hunan, China. Infect Dis (Lond). 2016 Oct. 48 (10):744-8. [Medline]. Ornoy A, Tenenbaum A. Pregnancy outcome following infections by coxsackie, echo, measles, mumps, hepatitis, polio and encephalitis viruses. Reprod Toxicol. 2006 May. 21(4):446-57. [Medline]. Ooi MH, Solomon T, Podin Y, et al. Evaluation of different clinical sample types in diagnosis of human enterovirus 71-associated hand-foot-and-mouth disease. J Clin Microbiol. 2007 Jun. 45(6):1858-66. [Medline]. [Full Text]. Lowes R. CDC Develops Faster Test for Enterovirus D68. Medscape Medical News. Available at http://www.medscape.com/viewarticle/833210?src=wnl_edit_newsal&uac=106950CX. Accessed: October 22, 2014. Piqueur et al. Improvement of a real-time RT-PCR asay for the detection of enterovirus RNA. Virology Journal. 2009. 6:95. Michos AG, Syriopoulou VP, Hadjichristodoulou C, et al. Aseptic meningitis in children: analysis of 506 cases. PLoS One. 2007 Aug 1. 2(7):e674. [Medline]. Wang K, Wu Y, Yin D, Tang S, Hu G, He Y. Development and evaluation of a rapid recombinase polymerase amplification assay for detection of coxsackievirus A6. Arch Virol. 2017 Jan. 162 (1):287-290. [Medline]. Haneke E. Electron microscopic demonstration of virus particles in hand, foot and mouth disease. Dermatologica. 1985. 171(5):321-6. [Medline]. Parra CA. Hand, foot and mouth disease. Light and electron microscopic observations. Arch Dermatol Forsch. 1972. 245(2):147-53. [Medline]. Cheng BN, Jin YL, Chen BQ, Zhu LY, Xu ZC, Shen T. Serum cholinesterase: a potential assistant biomarker for hand, foot, and mouth disease caused by enterovirus 71 infection. Infect Dis Poverty. 2016 Mar 29. 5:27. [Medline]. Hopper SM, Babl FE, McCarthy M, Tancharoen C, Lee KJ, Oakley E. A double blind, randomised placebo controlled trial of topical 2% viscous lidocaine in improving oral intake in children with painful infectious mouth conditions. BMC Pediatr. 2011 Nov 21. 11:106. [Medline]. [Full Text]. Goodfellow IG, Evans DJ, Blom AM, et al. Inhibition of coxsackie B virus infection by soluble forms of its receptors: binding affinities, altered particle formation, and competition with cellular receptors. J Virol. 2005 Sep. 79(18):12016-24. [Medline]. [Full Text]. Werk D, Schubert S, Lindig V, et al. Developing an effective RNA interference strategy against a plus-strand RNA virus: silencing of coxsackievirus B3 and its cognate coxsackievirus-adenovirus receptor. Biol Chem. 2005 Sep. 386(9):857-63. [Medline]. Zhang G, Zhou F, Gu B, Ding C, Feng D, Xie F, et al. In vitro and in vivo evaluation of ribavirin and pleconaril antiviral activity against enterovirus 71 infection. Arch Virol. 2012 Apr. 157(4):669-79. [Medline]. Abzug MJ, Michaels MG, Wald E, Jacobs RF, Romero JR, Sánchez PJ, et al. A Randomized, Double-Blind, Placebo-Controlled Trial of Pleconaril for the Treatment of Neonates With Enterovirus Sepsis. J Pediatric Infect Dis Soc. 2016 Mar. 5(1):53-62. [Medline]. Abzug MJ, Michaels MG, Wald E, Jacobs RF, Romero JR, Sánchez PJ, et al. A Randomized, Double-Blind, Placebo-Controlled Trial of Pleconaril for the Treatment of Neonates With Enterovirus Sepsis. J Pediatric Infect Dis Soc. 2016 Mar. 5 (1):53-62. [Medline]. Bauer L, Lyoo H, van der Schaar HM, Strating JR, van Kuppeveld FJ. Direct-acting antivirals and host-targeting strategies to combat enterovirus infections. Curr Opin Virol. 2017 Jun. 24:1-8. [Medline]. Baggen J, Jan Thibaut H, Strating JRPM, van Kuppeveld FJM. The life cycle of non-polio enteroviruses and how to target it. Nat Rev Microbiol. 2018 Apr 6. [Medline]. Ulferts R, de Boer SM, van der Linden L, Bauer L, Lyoo HR, Maté MJ, et al. Screening of a Library of FDA-Approved Drugs Identifies Several Enterovirus Replication Inhibitors That Target Viral Protein 2C. Antimicrob Agents Chemother. 2016 May. 60 (5):2627-38. [Medline]. Hou HY, Lu WW, Wu KY, Lin CW, Kung SH. Idarubicin is a broad-spectrum enterovirus replication inhibitor that selectively targets the virus internal ribosomal entry site. J Gen Virol. 2016 May. 97 (5):1122-33. [Medline]. Li R, Liu L, Mo Z, et al. An inactivated enterovirus 71 vaccine in healthy children. N Engl J Med. 2014 Feb 27. 370(9):829-37. [Medline]. Cai Y, Ku Z, Liu Q, Leng Q, Huang Z. A combination vaccine comprising of inactivated enterovirus 71 and coxsackievirus A16 elicits balanced protective immunity against both viruses. Vaccine. 2014 May 1. 32(21):2406-12. [Medline]. Wang W, Song J, Wang J, Li Y, Deng H, Li M, et al. Cost-effectiveness of a national enterovirus 71 vaccination program in China. PLoS Negl Trop Dis. 2017 Sep. 11 (9):e0005899. [Medline]. Yee PTI, Laa Poh C. Impact of genetic changes, pathogenicity and antigenicity on Enterovirus- A71 vaccine development. Virology. 2017 Jun. 506:121-129. [Medline]. Waldfahrer F, Iro H. Successful treatment of herpangina with allopurinol mouthwashes. Laryngoscope. 1995 Dec. 105(12 Pt 1):1405. [Medline]. Horsten HH, Fisker N, Bygum A. Eczema Coxsackium Caused by Coxsackievirus A6. Pediatr Dermatol. 2016 May. 33 (3):e230-1. [Medline]. Disclosure: Serve(d) as a director, officer, partner, employee, advisor, consultant or trustee for: American Academy of Dermatology;UpToDate;Medical Review Institute of America<br/>Received income in an amount equal to or greater than $250 from: American Academy of Dermatology; Medical Review Institute of America.